WHEN SIXTH-GRADER GREYSON CHANCE PERFORMED a piano-and-voice cover of Lady Gaga's "Paparazzi" at an Edmond, Oklahoma, talent show in April 2010, he went over big. Very big. A YouTube video of his performance quickly went viral, gaining ten thousand views in just a few weeks. Within a month, Greyson had performed on The Ellen DeGeneres Show and scored a record deal on Ellen's newly minted record label, eleveneleven. So far that talent-show video has garnered more than 43 million views, and Greyson's life has become a blur of activity: multiple appearances on national television, performances in London and Paris, tours supporting Miranda Cosgrove and co-headlining with Cody Simpson, two singles, two big-budget music videos, and a debut LP, Hold On 'Til the Night, released August 2. Some musicians would find it hard to adjust to life in the limelight, but not Greyson, who at 14 projects more poise than some performers do at 40. "Yes, I've been very busy for the last year," he laughs. "But I like to stay busy. I have a big job to do this year, and that's promoting this record." 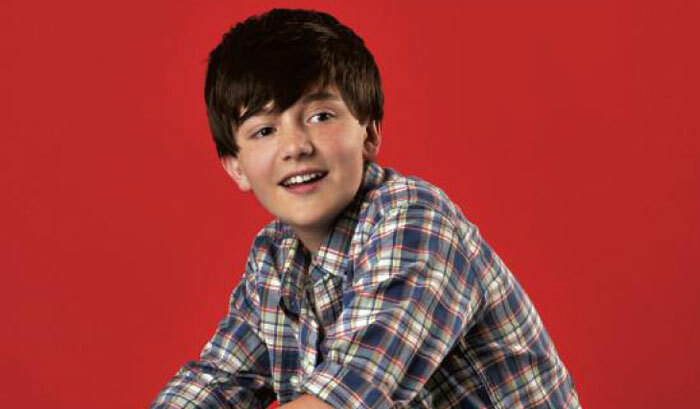 Greyson worked with several top songwriters to craft the album, including songwriting and production team The Matrix (Avril Lavigne, Hilary Duff, Katy Perry), David Jost, Billy Steinberg, Da Internz, and more. "It's a very real record," he says. "I think pop music kind of has that bad reputation where everybody says, 'Oh, it's always so fake, it's all about Hollywood.' And that's really not true. I want people to feel all the different emotions when they listen to this record, and I want them to know that it's real. I want them to live and breathe in the record. I want this record to be their home." 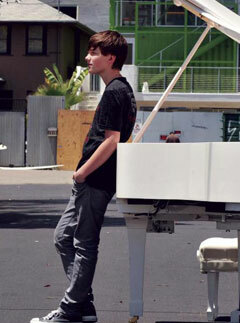 Greyson began playing piano at age eight, though he didn't start lessons until he was nine. "I don't take lessons anymore," he says, "mainly because I'm always on the road, and it's kind of hard to find a piano teacher that will travel with me. But I still play a lot. In Edmond I have a Yamaha baby grand that I play nonstop when I'm home." He also plays Yamaha pianos in the studio and on his many television appearances. "Wherever I go, they usually have Yamahas, and that's what I like to play on. What I love about Yamahas is the feel. They always feel really good, and they always feel the same. That's very important, because different pianos can have different feels, different keys, and it messes you up. But with Yamaha, the feel of the keys is always the same." For live shows, Greyson created a signature showpiece that also appears in his first video: a grand piano shell that houses a Yamaha Motif workstation, with dramatic, graphic words covering every surface." "Every single word has a significance to the record," he explains. "I put love, I put hate, I put happiness, I put dreams. A couple of the words are actual songs from the records. It's not a real piano, but we put a Yamaha keyboard in it, because I love playing on the Motif-it's the only digital piano I'll play on." Touring has become a favorite part of Greyson's new career. "You really see how the hard work pays off," he says. "You see the fans, the T-shirts, the posters. The energy is just so amazing. You wake up every morning and you have to do this, you have to do that, you have to do interviews, and then you go onstage, and then it's 12 a.m. before you leave, and you can't find food." He laughs. "It's just this whole fun, different world, and I love performing for the fans. Seeing how much trouble they go to, to buy a ticket or make a T-shirt, and do everything that they do. It's very inspiring." What I love about Yamahas is the feel. They always feel really good, and they always feel the same. Despite the screaming fans and bright lights, Greyson strives to stay focused as he navigates his newfound stardom. "None of this is what you would think it would be," he reflects. "The music industry and the TV industry-it takes a lot of hard work. Being on TV, you have to draw your energy from an audience that isn't really there. You have to think about who's watching. There's schedules, and timings-it's a very interesting world, but you have to find your own place in it." So how does it feel to look back on the months since YouTube changed this young musician's life? "It's a feeling of, 'How did this all happen?'" Greyson says. "It's been such an amazing and crazy year. But I love being able to go into the studio. I love having this connection with my fans. I'm just very excited to be here."